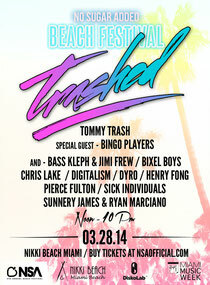 Having recently kicked off his Trashed residency with the Wynn in Las Vegas, Tommy Trash is bringing his Trashed parties down to Miami Music Week at the end of the month. Tommy and crew will be taking over Set Nightclub on Thursday 27 March and Nikki Beach for No Sugar Added on Friday 28 March. Joining Tommy will be support from artists including Bingo Players, Clockwork, Dyro and more.